The Institute of Advanced Studies is pleased to be a co-sponsor of a series of events as part of the 'Afghanistan: Hidden Treasures from the National Museum, Kabul' exhibition, presented by the WA Museum. 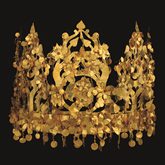 The 'Afghanistan: Hidden Treasures from the National Museum, Kabul' exhibition is based on nearly 230 objects drawn from a series of remarkable archaeological discoveries in Afghanistan, subsequently heroically preserved from the destruction wrought by war. The exhibition will be on show at the Western Australian Museum – Perth, from 26 July to 16 November. Afghanistan lies at the heart of the great Silk Roads. It is a region rich in natural resources, and as early as the 3rd millennium BC Afghanistan became part of the first web of international contacts in the ancient world. From this point on, as invaders came and went and the trade routes crossing from all points of the compass flourished and faded, her history became a rich tapestry of influences that stretched from the Mediterranean Sea to the Pacific Ocean and from Siberia to the Indian sub-continent. From the lapis trade to the Great Game, this talk illustrated some of the key events through the ages that defined Afghanistan and made her a central player in the history of Asia. Alison Betts specializes in the archaeology of the lands along the Silk Roads from the Near East to China, with a particular interest in the study of nomadic peoples. She has worked extensively in eastern Jordan and Central Asia, and currently runs major Australian Research Council funded field projects in Uzbekistan and Xinjiang, western China. She also works with the Kabul Museum in Afghanistan and has research affiliations in Kazakhstan, Kyrgyzstan and Kashmir. Professor William Maley, AM FASSA, Professor and Director of the Asia-Pacific College of Diplomacy, Australian National University. Afghanistan has long been famous for its rich material culture, a product of its history as a crossroads of diverse civilisations. Its diverse cultural norms have also long been recognised by researchers, although perhaps less by those responsible for popular images of what Afghanistan is like. What is arguably less appreciated is that it is currently undergoing a phase of very rapid sociocultural change, casting doubt on some of the simple verities that have often underpinned such images. In this lecture, Professor William Maley explored how forces of globalisation are generating patterns of modernisation very different from the ideologically-driven modernisation promoted by Marxist activists after the April 1978 communist coup, and argued that these are likely to be the most durable legacy of the years since the overthrow of the Taliban regime in 2001. Dr William Maley has served as a Visiting Professor at the Russian Diplomatic Academy, and a Visiting Research Fellow in the Refugee Studies Programme at Oxford University. He is a member of the Australian Chapter of the Council for Security Cooperation in the Asia Pacific (CSCAP). A regular visitor to Afghanistan, he is author of Rescuing Afghanistan (London: Hurst & Co., 2006), and The Afghanistan Wars (New York: Palgrave Macmillan, 2002; 2009); co-authored Regime Change in Afghanistan: Foreign Intervention and the Politics of Legitimacy (Boulder: Westview Press, 1991), and Political Order in Post-Communist Afghanistan (Boulder: Lynne Rienner, 1992). In this lecture, Barat Ali Batoor discussed his journey and the persecution of the Hazaras in Afghanistan and Pakistan and their migration to Pakistan and then to Australia. Barat Ali Batoor was born in 1983, in a family that was driven out of Afghanistan during civil war when most of his people were massacred. He returned to his ancestral country for the first time after September 11, 2001, when the Taliban regime was still in Kandahar. After visiting the devastation and destruction of 23 years of war, Batoor decided to draw the world’s attention to the plight of the Afghani people the problems facing the country. He chose photography as his medium of expression. Batoor started photography in 2002 and launched his first solo exhibition in 2007. His works have been published in magazines, newspapers and catalogues such asThe Washington Post, Newsweek, Wall Street Journal, Stern, India Today, Afghan Scene, Risk Magazine,The Global Mail, The West Australian,Strategic Review and others. He participated in the “Lahore Artist’s Residency” in Pakistan and was the 2009 recipient of a photography grant from New York’s Open Society Institute for the project “Child Trafficking in Afghanistan/The Dancing Boys of Afghanistan”. At the Nikon-Walkley Awards in Australia this year, Batoor won Photo of the Year and was a winner in the Photo Essay category. In this special event, Fred Smith, singer, songwriter and diplomat shared his reflections on Afghanistan from his experience of working closely with tribal leaders during the two years he spent as a diplomat and political advisor in Uruzgan province. His job was to comprehend the complex web of tribal and patronage networks within which Australian troops were operating. This required him to see the world, not only through the eyes of Australian troops, but those of the Afghan’s as well. He did all this and more, returning with a dozen songs for the album Dust of Uruzgan. Fred Smith’s presentation was coloured by projected images from Defence Force and other photographers, as well as a selection of songs including Live like an Afghan.